The US Coast Guard said the drugs offloaded in Florida last week stemmed from two different interdiction at sea. [www.inewsguyana.com] – The United States Coast Guard on Saturday revealed the seizure of over 6,000 pounds of marijuana in the Caribbean Sea. 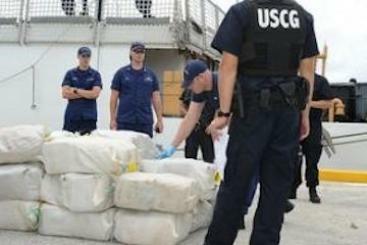 The Coast Guard said the crew of the Cutter Thetis offloaded the drugs at Coast Guard Sector Key West, Florida on Wednesday, stemming from two different Caribbean Sea interdiction. The suspects were apprehended and the crew recovered 69 packages, which later tested positive for marijuana. In another interdiction, a US Coast Guard Law Enforcement Detachment (LEDET) aboard a United Kingdom Royal Fleet Auxiliary vessel, assigned to Joint Interagency Task Force South (JIATFS) detected a Jamaican fishing vessel jettisoning packages overboard. The US Coast Guard said the Jamaican Defense Force authorized the LEDET to board the flagged vessel and apprehend the suspects, recovering 55 packages, which later tested positive for marijuana.